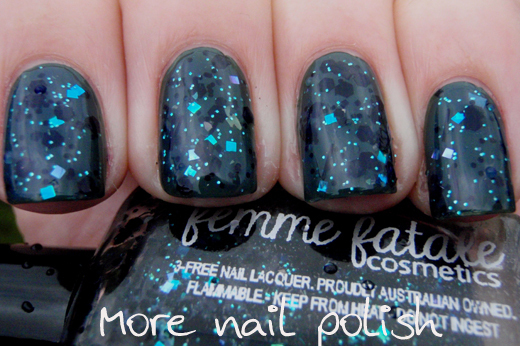 Two more pretties from Femme Fatale Cosmetics today. Ebon Roses, shown here as one coat over Ulta3 Pink Peony, is full of quite a few shades of pink glitter, including rose, fuchsia, holo pink and ultra fine flecks. There is also a light sprinkling of chocolate brown glitter. 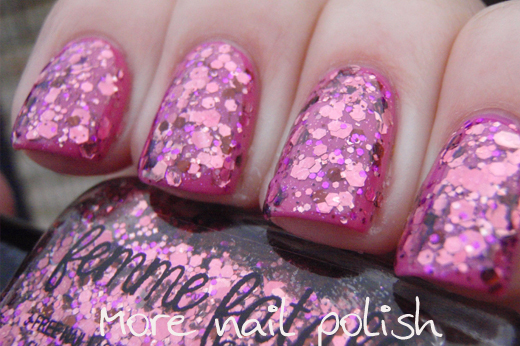 This is of of those glitter polishes that can look quite different depending on what you layer it over. Here over a bright pink, it really pulls out the pink tones. But over rose and peach colours it brings out the golden rose and brown glitters. 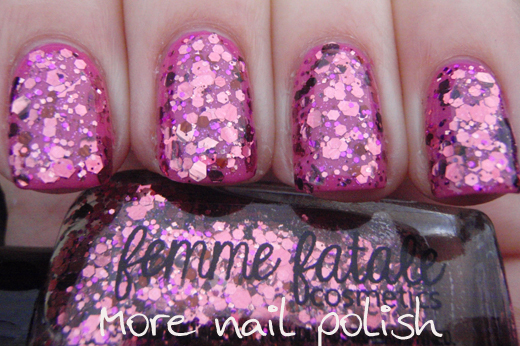 Great glitter pay off in this polish, but it's not at all dry or difficult to apply. Eternium Dreams is such a deep and dark interesting polish. Eternium Dreams does have a blackened tinted base, but this time around I decided I wanted to layer it. Although, I really didn't know what to layer it over. I didn't want to put it over black because then all the multiple shapes and sizes of black glitter would be lost, but I knew it needed some sort of dark base because of the iridescent green/blue colour shifting squares. 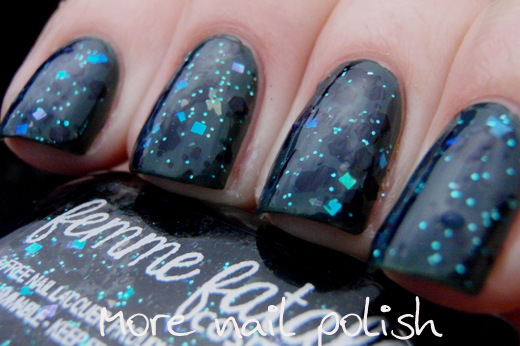 I ended up choosing RBL Orbis Non Sufficit - which is quickly becoming my go to dark green creme. 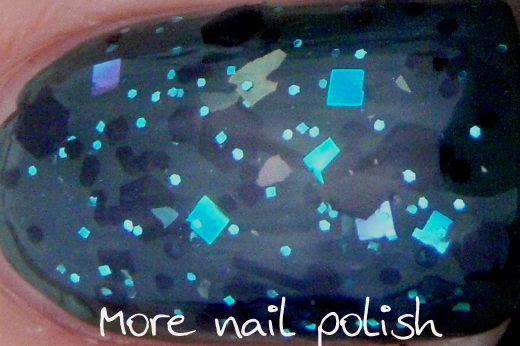 The base was just perfect, still dark and mysterious so iridescent squares and aqua micro glitters really pop, but light enough to show the black glitters. 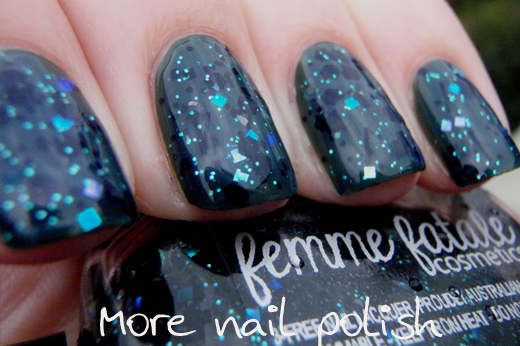 This is one coat of Eternium Dreams with Seche Vite top coat. 5ml mini bottles are $4 each and full sized 13ml bottles are $10.50, but like I mentioned last time Femme Fatale only ships to Australia at the moment. OMG I would give up my entire collection for Ebon Roses! 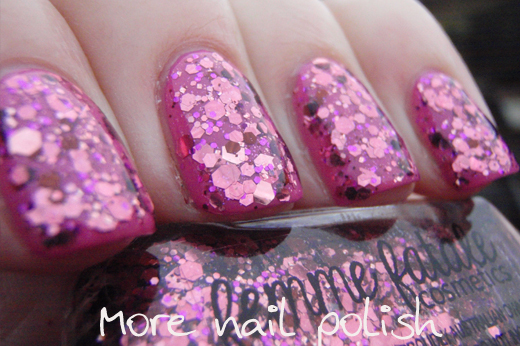 It's one of the most beautiful glitter polishes I've ever seen! I wish she shipped to the US! Thanks for sharing with us! 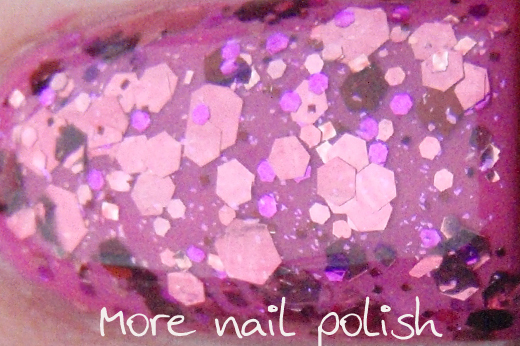 Holy cow, I love these two polishes! Yum! 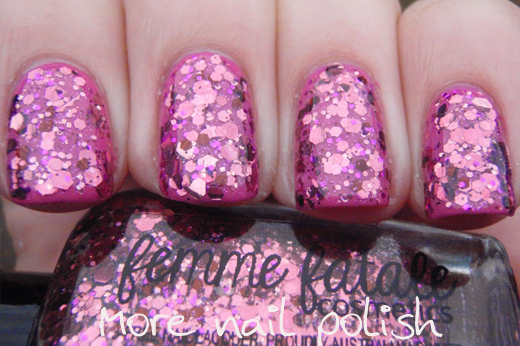 I guess it's our turn in the USA to be jealous of Aussie polishes. These are delicious! (No, despite my adjectives and exclamations, I don't want to eat glitter.) 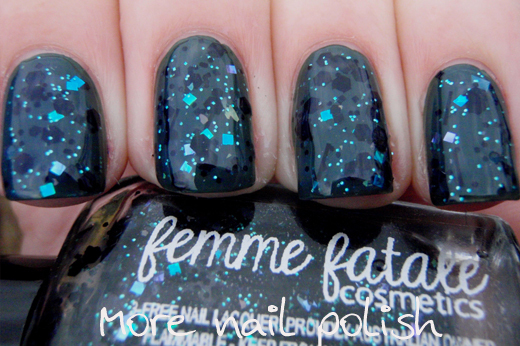 Femme Fatale and Emily de Molly are two brands I would love to see here. Maybe they will make it to Ninja Polish or a similar store. Sigh.